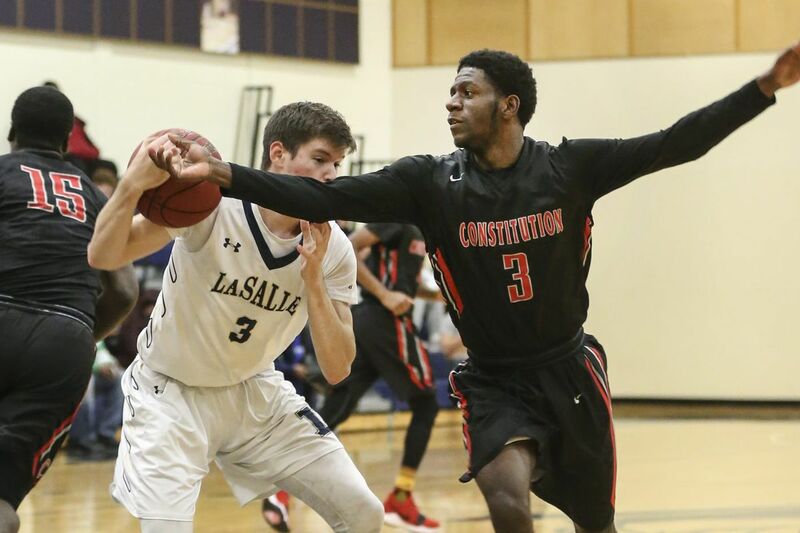 Constitution's Hakim Hudson tries take the ball from La Salle's Sean Simon during the quarter in Wyndmoor, Wednesday, December 13, 2017. David Robinson poured in 38 points Tuesday as the North Penn boys' basketball team upended William Tennent, 85-77, in overtime. Chris Coleman contributed 22 points for the Knights. Sean Simon scored 22 points, surpassing 1,000 for his career, as La Salle defeated Lansdale Catholic, 78-49. Matt Dade scored a game-high 27 points as Episcopal Academy knocked off Shipley, 82-71. Alex Capitano added 22 points for the Churchmen. Sam Sessoms made nine threes and scored 32 of his 35 points in the second half for the Gators. Mike Ziegler put up 30 points as Phoenixville topped Pottsgrove, 65-59. Seth Pickney's 15 points lifted Archbishop Wood over Father Judge, 53-42. Colin Reed scored 22 points as Archbishop Ryan took down Cardinal O'Hara, 67-57. Darius Kinnel led all scoers with 20 points as St. Joseph's Prep defeated West Catholic, 75-55. Kyle Thompson and Ed Croswell each contributed 18 points for the Hawks. Jack Clark had 18 points and 16 rebounds in Cheltenham's 65-50 win over Upper Moreland. Rachel Christman scored 11 points in Spring-Ford's 48-35 triumph over Boyertown. Cassie Marte added 10 points for the Rams. Kylie Halko and Lexi Brett combined for 25 points as Hatboro-Horsham beat Quakertown, 43-31. Myah Garrison scored 11 points in Bonner-Prendergast's 65-14 win over Hallahan. May Sharif added 10 points for the victors. Megan Jonassen scored 12 points in Perkiomen Valley's 49-13 victory over Norristown. Sarah Huston finished with 22 points and 11 assists in Coatesville's 75-46 defeat of McCaskey.